Half this cookie is missing but we don’t have a dog. WTH? Your Roman Reporter Cathy Keisha has all the news that’s fit to blog about on this early Senile Saturday. 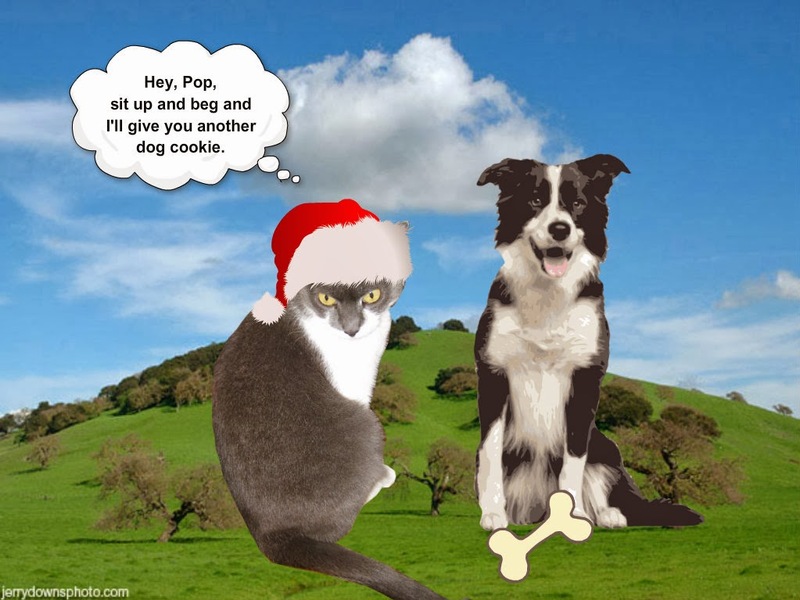 Today's blogcast is about the dog cookie heard 'round the world. I’m on location in my very own condo. My Pop has no shame. He also declined to be innerviewed. And this is me and Pop after he ate the cookie. Here’s a picture of Sophia enjoying the cookies that Pop was nice enough to leave for her. Her Mom, loyal reader Cathy, took the photo and said she loved them even more than Pop did. BREAKING NEWS: I’m featured today in Zoolatry. Zoom on over and check it out! Ewww! That dog cookie does not sound at all tasty to me - where's the chicken? Plus I heard somewhere that 15% of humans taste their cats' food! Don't they have enough of their own? BOL omd your pop definitely doesn't have any shame! I eat some of Shiner's treats sometimes. I mean not the whole thing, but maybe just a small bite for sampling purposes. What the heck with sending you dog stuff? Hopefully they have figured out you aren't a dog, CK. You're way too cool a cat for that. Sigh Dogs get all the good stuff they totally should have cat cookies as well. LOLLLLLLLL! Good one CK. I love that Pop at the doggie cookie. M said she's tempted to try my food now and then. Hisssss, she'd better leave mine alone. I don't get enough to eat as it is these days what with a d.i.e.t. and all. DOG stuff! How could they??? We hope you got a proper KITTY treat! Ummm a dog cookie, your Dad ate...ummm well ... it sounds like it was tasty at least! But we think you should have gotten some cats things! 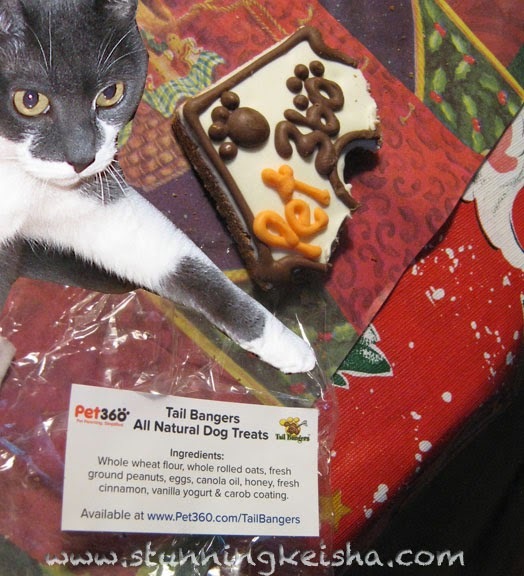 Um, maybe Pops should get some human cookies and leave the dog cookies for the dogs! Well they are big supporters of DogPaws. Whoa! Glogirly will eat just about ANYTHING with frosting on it...but a DOG cookie??? Our Grandpaw ate cat kibbles once! Long story...and we don't have such GREAT photographic proof like you, CK...what a FAB story! We agree with Glogirly. Frosting can cover a multitude of sins...but a DOG cookie??? Now, it's true that The Human and her little friends tried Milk Bones dog biscuits once, but they were about 8 years old, so there's some excuse for them. Well in your Pop's defense, it does LOOK delicious...tempting...and who knows - I might even give it a lick if it was right there staring at me. As for your being featured in Zoolatry? WOOT!!!! Wow, Pop is brave but I'm with Sammy, the cookie does look delicious. :) I will go check out your Zoolatry post now. Congratulations and Happy Holidays! Whenmyhuman brother was younger and lived at home, he used to eat the dog cookies!Yep! Him and the Hairy Slobbery Sister Kokanee would shares them in bed! Your Pops is purrty funny! We think your Pop is adventurous a.k.a. not boring!